Now that iPhone and iPad users can delete default apps from their iOS devices, you may find it important to know how to re-download those stock apps to reinstall them back onto your iOS device. This is possible with any of the default apps bundle with iOS that can be deleted and then restored, including Calendar, Calculator, Compass, Contacts, FaceTime, Find My Friends, Home, iBooks, iCloud Drive / Files, iTunes Store, Podcasts, Mail, Maps, Music, News, Notes, Podcasts, Reminders, Stocks, Tips, TV / Videos, Voice Memos, Weather, and Watch. Restoring deleted default apps is done largely the same way you would recover any other accidentally deleted app on an iPhone or iPad, achieved entirely through the App Store of iOS. If you’ve never gone through this process before it may sound intimidating, but once you run through the steps yourself you’ll find it’s quite simple. If you want to try this out yourself, delete any default preinstalled app from your iPhone or iPad, like the “Weather” app or “Music” app for example. A full list of default apps that can be deleted and restored is further below if you want shortcuts to the apps. As you can see removing stock apps from an iPhone or iPad is done the same way you remove any other app on an iOS device, but the capability to remove the default bundled apps on iOS devices is rather new. * Note that you’ll want to be sure you are downloading the correct default iOS app again to reinstall the intended app. 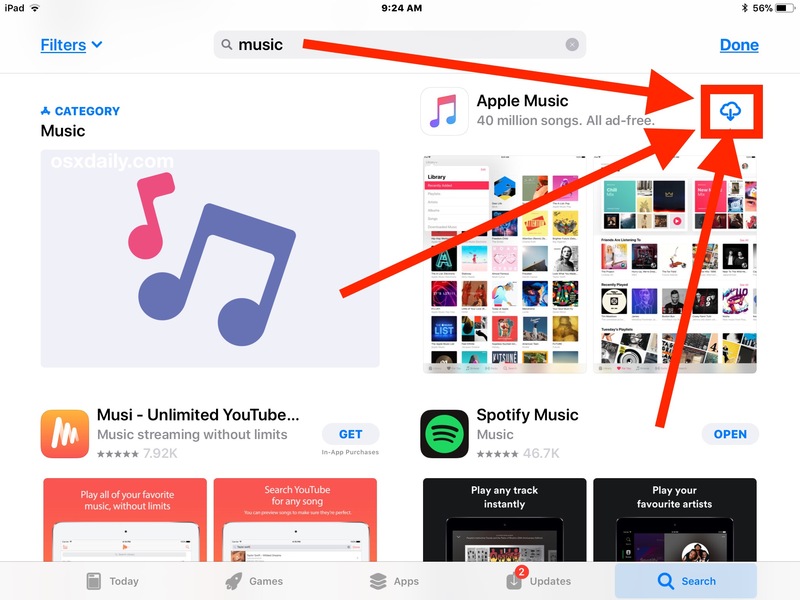 This is more important now that the App Store stuffs ads at the top of search results, along with the generally broad search results often appearing in the App Store for apps with similar purposes or even the same names. For example, there are multiple other music apps, but only one official “Music” app from Apple. 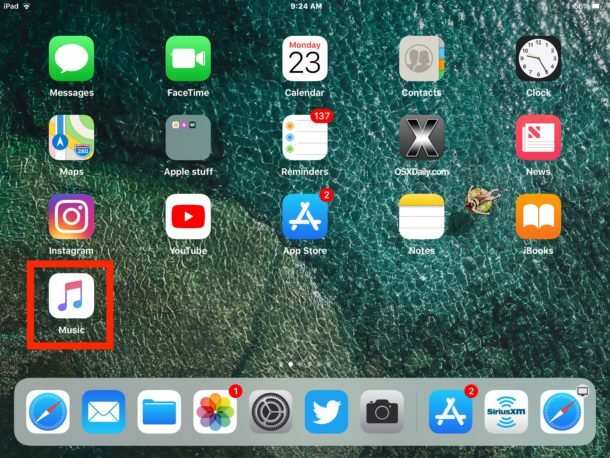 To restore the proper default app, verify the app icon is the same as the default app on the iOS device, and that the developer of the app is Apple. You can also follow direct App Store links to the iOS default apps if you don’t want to bother with the Search function in the App Store of the device. Regardless of how you get to the default app, re-downloading it and restoring it to the device is the same. These URLs point directly to the App Store entries for the default stock apps in iOS that can be deleted and thus restored by re-downloading again. Whether or not you want to delete and then reinstall default apps is entirely up to you and how you use your iPhone or iPad. 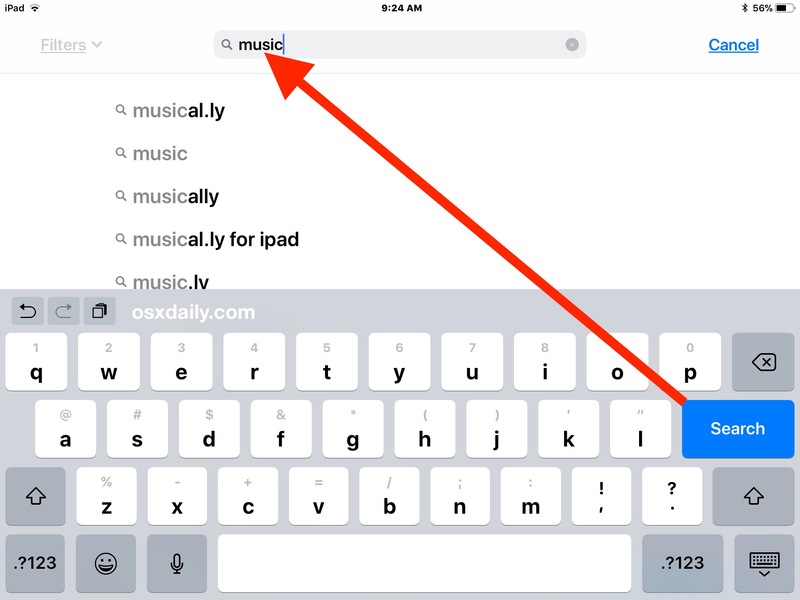 For example, maybe you want to delete the Music app to stop the annoying auto-playing car Bluetooth audio iPhone thing, or maybe because you’d prefer to use an alternative music service like Spotify. There are a few apps you can not re-download and reinstall, because they can not be deleted in the first place. That includes default apps like Settings, App Store, and Safari. Why doesn’t Voice Memos app download to my 10.5″ iOS 11.03 iPad Pro? App Store says my iPad Pro doesn’t have “specific features available”. I thought it had all it needed. That’s an iphone exclusive stock app, I believe, just like calculator or wallet. “Deleted.” Hidden would be far more accurate. Of course blame for that lies with Apple for not just making most of the first-party apps more self-contained and let people actually remove them. No reason to make this all confusing as they insist on doing. I guess that depends on the app. I recently removed and restored the maps app on my iphone 6s and while restoring, I did see the little circle filling up just like with the 3rd party apps. So I guess it did delete at least some of the files related to the app when I removed it. It deletes user-data/preferences for the app. The application itself and the frameworks associated with it don’t go anywhere. The whole “go to the App Store” and “loading” indicators are just for show. They probably put as much work into this hilarious half-measure that they would’ve into just letting people legitimately delete the apps. It would’ve just been easier to have a list of toggles like the 3rd gen. Apple TV. Not all user data is deleted. I had some favorites in the maps app and they still showed up after “deleting” and restoring the app. Maybe so. That’s just what Apple claimed when asked about the feature when it launched. I’m on iOS 6 so I’ve never personally played with any of this other than quick tests here and there. I don’t throw them away, I put everything I don’t want (to clutter the screen) into a separate folder. As another poster already said, hidden would be a far more accurate description rather than deleted. And rather than reinstall, I would suggest reappear. Thank you for sending me osxdaily items. As a macOS/iOS user I have found your items very interesting and at times quite useful in ones learning curve. The link listed to restore “News” didn’t work, but the others do. I removed podcast and wiuld like it back. When i go to Apps it shows it as open but it will not open. I Have the same problem. When I click on the cloud with the downward arrow to reload it, it starts and gets immediately after, and does n not load. I have read aple how-to posts: tried resetting it, restarting it, holding this and that button simultaneously, performing open heart surgery and nothing works. All I want is the podcast app back, any further suggestions? I am trying to reinstall the news iOS default app and I am unable to find it In the App Store. I used the url in the explanation given but the link does not work. Please help? I’m trying to re-install the’Videos’ app and it says that ‘ this app requires specific features not available on this device’, how can i find what i need to re-install the app? It is all rubbish I deleted the default ‘ News ‘ application accidentally and have been trying hard to reinstall it but failed miserably. I have followed the directions step by step but first of all the News application doesn’t appear at all while you search in the apple store. I deleted the default ‘ News ‘ application accidentally and have been trying hard to reinstall it but failed miserably. I have followed the directions step by step but first of all the News application doesn’t appear at all while you search in the apple store. Here is the direct link to the Apple News app download, if you deleted the Apple News app and want to reinstall the Apple News app onto your iPhone or iPad you can download it again from Apple this way. The Apple News app is located in the App Store app in iOS, it will not be in the Apple Store app. Apple has a lot of apps with similar names and different stores, including iTunes Store, iBooks Store, Apple Store, App Store, etc, all are different. Any chance someone has the link to reinstall the default clock app? I can’t find it in the app store anywhere, ughh! I am new to Apple and recently purchased an iPhone 8 Plus a week ago and accidentally deleted the Find My Friends app. I can see it in the App Store, but there is no download icon. It simply says “open.” When I click this the app opens, but it is no where on any of my screens as an app. I accidentally unstall my iplay app on my iPhone and I can’t find it in App store. I just figured out why I couldnt redownload and open my podcast app. Go to General>Restrictions then make sure Podcasts is turned on. Now you should be able to open up the app again. Hope that helps! I accidentally deleted the iTunes Store app from my iPad Pro, iOS 12.0.1. Every time I try to download the app again, from the App Store I receive a message “Unable to Install “iTunes Store” Please try again later.” What am I doing wrong? How do I get the app back onto my iPad Pro? Recently my iPad was replaced with a newer iPad instead of repaired, it was sent from China, when we installed the backup that was on a Mac, there was no apple messages app, so we tried to download it from the apps store. When we did a search for it in the app store all I see are 3rd party apps, no apple messages. We noticed it only because we could not get into the iPad at first because we needed a 2 factor password, even though as far as I know we never set the iPad for any 2 factor password, I guess Apple is supposed to send the password to us, but we could not find it anywhere, still at a loss on this 2 factor password thing. Is there someplace to disable this 2 factor password thing? Another thing all passwords were not backed up. It seems that only an encrypted back up does this I think, Apple should be way more clear on backups. When we sent the iPad in for repair Apple never said anything about losing passwords and encrypted backups, they just said back up the iPad, which we did unencrypted and in so doing lost almost all passwords to Apps and settings in Mail, causing us to search for mail passwords on 3 different accounts, took almost half a day to search in records for simple Mail Account passwords that we have not needed for a couple of years now. Thank you so much, you gave me the link to put NOTES back on my iPad. pple was useless and just caused me grief.